Musical theater (or musical theatre) is a kind of performance in a theater. A work of musical theater is called a musical. It uses acting, music, songs, and often dance. Some musicals (for example Les Misérables) have only a few lines of dialogue. Everything else is sung. It is usually a mixture of speaking and song. Some well-known musicals are West Side Story, The Sound of Music, Chicago, and Oklahoma!. Music has been a part of drama since ancient times, but modern Western musical theatre emerged during the 19th century. Around 1850, the French composer Hervé was experimenting with a form of comic musical theatre that came to be called opérette. The best known composers of operetta were Jacques Offenbach from the 1850s to the 1870s and Johann Strauss II in the 1870s and 1880s. Offenbach's melodies, and his librettists' satire, formed a model for the musical theatre that followed. 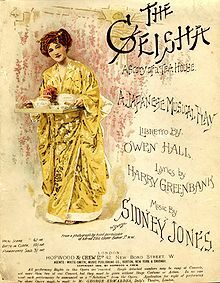 Important influences were the works of Gilbert and Sullivan in Britain and those of Harrigan and Hart in America. These were followed by the numerous Edwardian musical comedies and the musical theatre works of American creators like George M. Cohan. ↑ 1.0 1.1 Lubbock, Mark. 1957. The Musical Times. 98, #1375 (September), pp. 483–85. "The Music of 'Musicals'". This page was last changed on 12 September 2018, at 20:53.